Flo Furlow knows first-hand what is at stake down at Fresno in the IHSS representation battle. She is one of the people whose lives will be directly affected by the outcome of the upcoming ballot. I am a home-care worker in Fresno County and an elected leader of the National Union of Healthcare Workers. Over the years, I've been proud to have helped make it possible for many people to live in their own homes, which is exactly where they have wanted to be -- living in their homes, and not in nursing homes. Right now, I work for two clients who, I know in my heart, are living longer and happier lives because of Fresno County's In Home Supportive Services Program. I suppose I came to this work through the civil rights movement. I was just a kid when I got arrested for sitting at a Woolworths lunch counter in Little Rock, Arkansas. When the manager came over to say that they didn't serve our kind, I remember telling him, "Oh, don't worry. We're not planning on ordering anything." I had some explaining to do to my parents when they picked me up from the police station. The home-care movement for me has been part of the history of the civil rights movement. Years ago seniors and people with disabilities began organizing under the slogan, "Our homes, not nursing homes." They said that the sad history of locking people away in institutions, where they would be out of sight and out of mind, had to end. Home-care workers agreed. And in 2002, 10,000 of us formed a union of home-care workers here in Fresno. We wanted to work with home-care consumers to make "Our homes, not nursing homes" a reality. We also did it to win dignity and a living wage for ourselves and our families. We knew that the work we did was important for our communities, and that it was worth more than poverty wages. The thing that made me most proud of the union we built was that it was based on a fundamental value we learned from our friends in the disability rights movement: "Make no decision about us without us." In our union, we elected our own representatives from neighborhoods all over Fresno County, and we made the decisions about our own futures. The era of dignity and respect for home-care workers had begun. We won our current wage of $10.25 an hour and lifted thousands out of poverty. But by 2009, some of our union's Washington, D.C., leaders had lost their way. The leaders of the SEIU, our parent union, came to believe that they were smarter than their own members, and that only they should have the right to make decisions for us. It all came to a head when they took over our local union and replaced all our elected local leaders with their appointed bosses flown in from other parts of the country. The aftermath of that takeover has been heartbreaking. Before the takeover, we had a strong voice in our union. We were able to stop wage cuts and protect services year after year for the Fresno's most vulnerable residents. Today we have no voice at all. Instead the only voice is that of out-of-touch SEIU officials we never elected, who this April locked us out of an arbitration over our own wages. The workers who bargained our contract with the county were shut out, and as a result, we are now watching our wages fall and our families' sense of security collapse while we have no voice to change it. But if there's one thing I learned from the civil rights movement, it's that you don't have to just accept injustice. So we didn't. Thousands of us signed petitions to keep our own elected leadership, under a new name, the National Union of Healthcare Workers. The leaders of NUHW are the health care workers and leaders we elected, who we trust and who respect our voices. We are voting in an election next week to take our union back, and to return it to the principle we founded it on: "No decision about us without us." I am excited to be voting for NUHW to put our union back on track to serving home-care workers and the people who depend on us. She's been there. She's done that. She's been a leader, and she is leading once again. 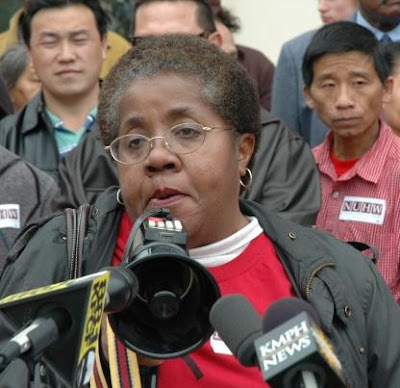 There really is no one that SEIU can stand up against this lady, is there?